A good halal burger is hard to find. 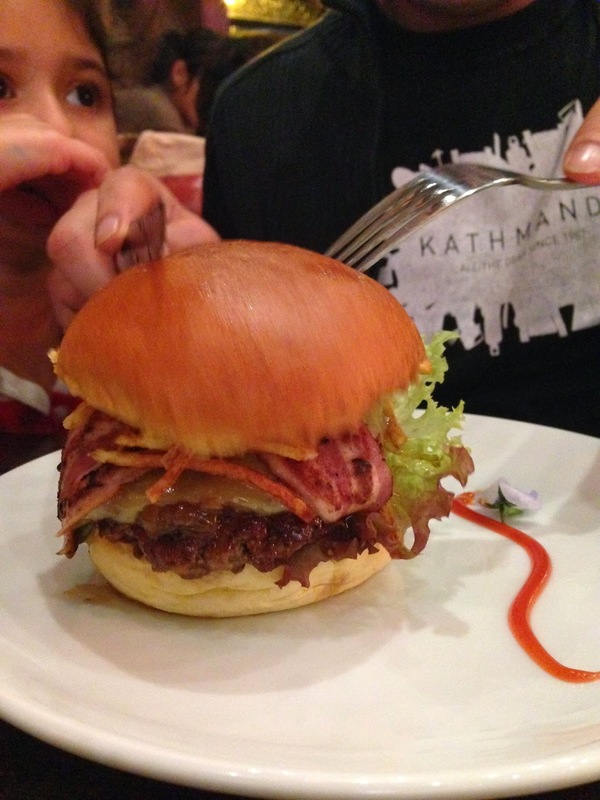 Meat & Shake have pretty much ended my quest for the perfect burger quite beautifully. Opened in September 2013, Meat & Shake have already established themselves in Tooting as a hip burger place oozing with funkiness. 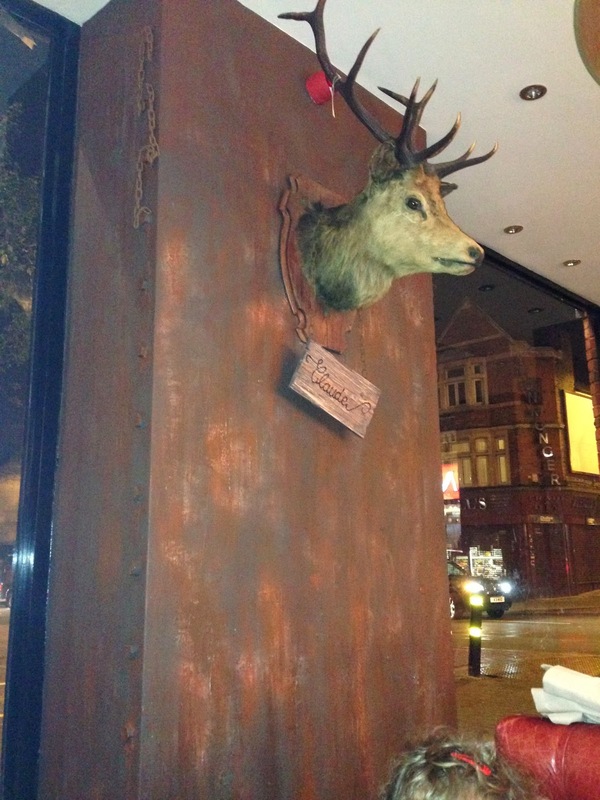 Cool, retro lighting combined with some interesting taxidermy on the walls makes this a unique place to dine at. 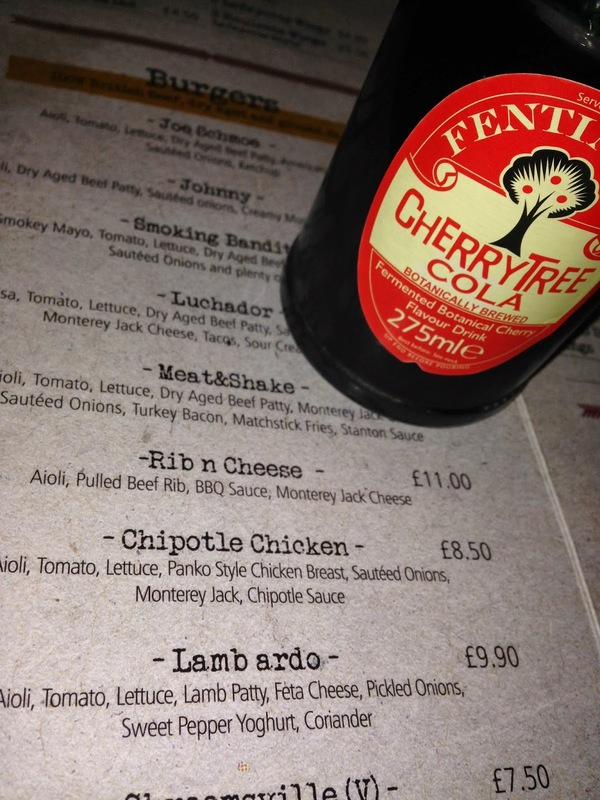 The menu is simple with a choice of burgers, hot dogs and wings/ribs dishes and a few sides to choose from. The kids menu is simple too, with the options being a hotdog or a burger-vegetarians need not apply. 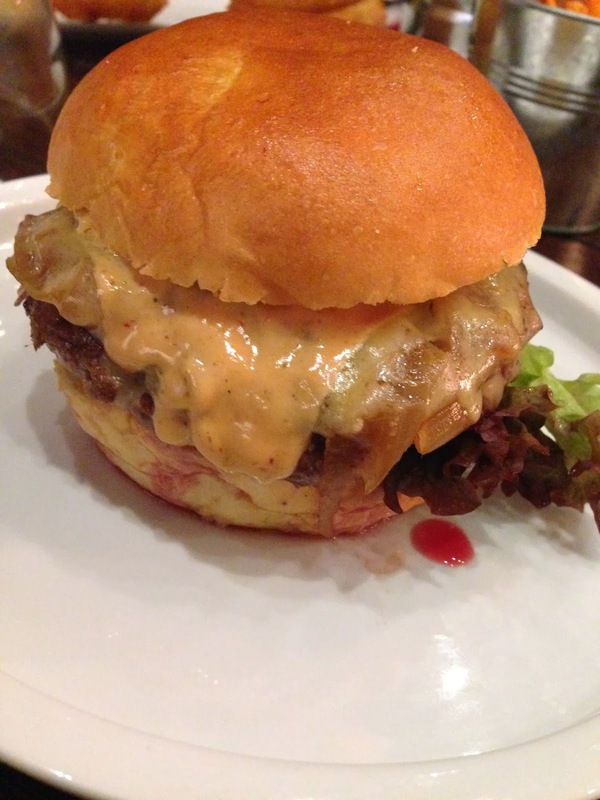 All the burgers on the menu are 100% dry aged British beef and are ground in the kitchen every day. 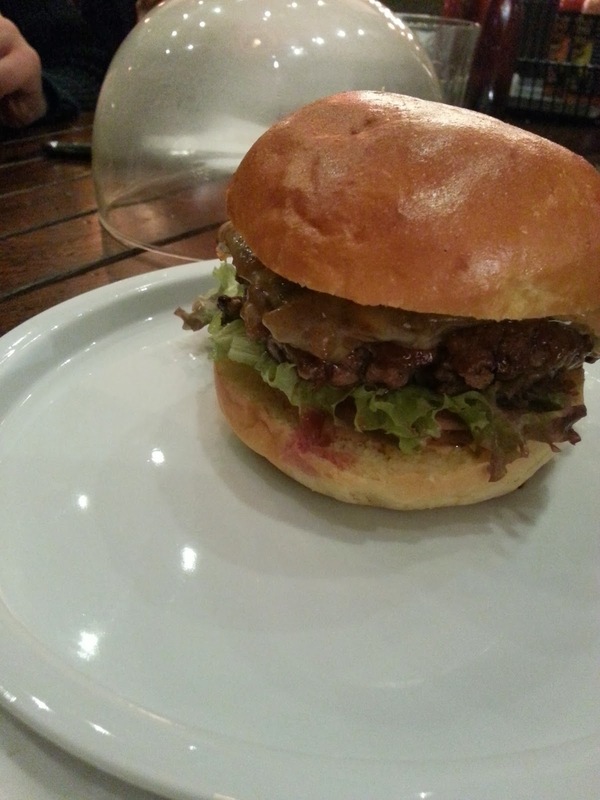 There is a choice of chicken, lamb and mushroom burger too if you’re not into beef. 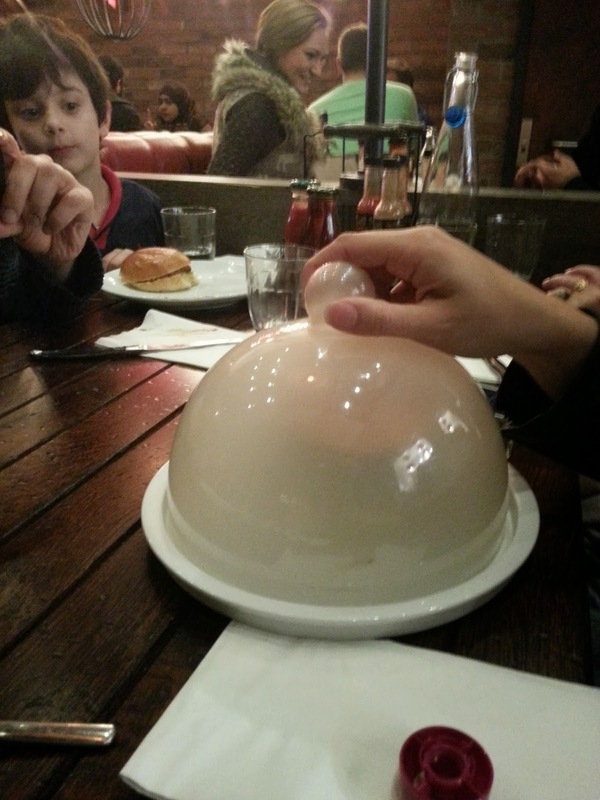 I chose the ‘Smokin Bandit’ which has smokey cheese, smokey mayo and is presented on a plate with a glass cloche on top. When you remove the lid, the smoke escapes and the wonderful aroma fills the air. 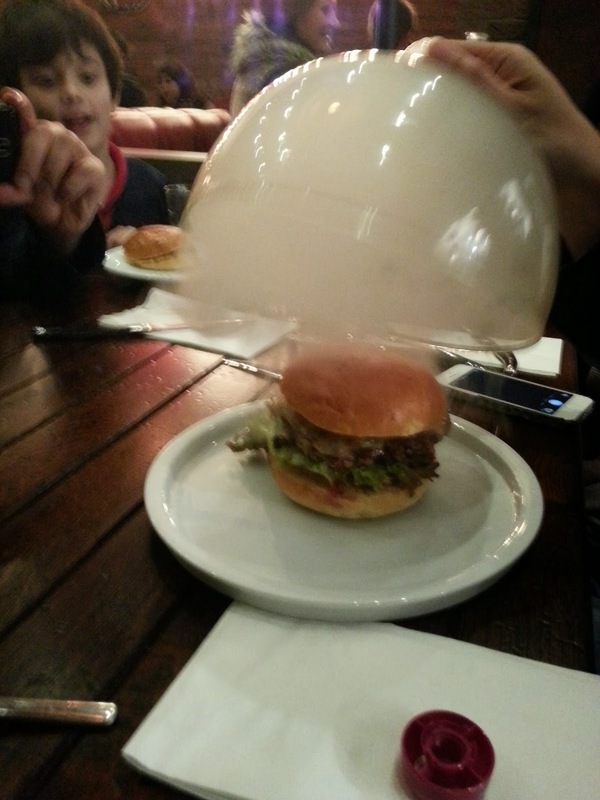 A very novel way of serving a burger! The flavours lived up to the dramatic presentation, with the beef patty being perfectly cooked, juicy and moist and seriously bursting with flavour. 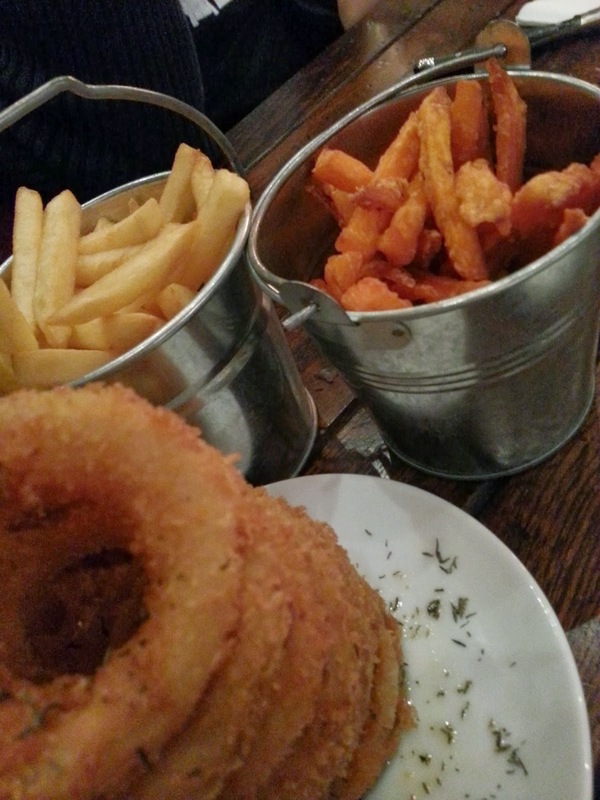 From the selection of sides, the onion rings though displayed delightfully were lacking in seasoning, and the fries quite basic. But the real winner here are the sweet potato fries which not only are better for you than regular fries (just forget they’ve been deep fried) but really hit the spot as a perfect accompaniment to your burger. Now on to milkshakes. Luckily we only ordered a couple of milkshakes between quite a few of us and they were more than enough. You have to have a seriously large appetite to be able to have a burger and a milkshake as the milkshakes are huge. Presented in a large steel glass, these mammoth milkshakes are rich, creamy and work as a great dessert rather than a drink to go with your burger. I say this because there is a huge drinks menu with non-alcoholic wine! No, not the same wine featured here, but a completely different brand. Also available are non-alcoholic beer and cider as well as Fentiman’s soft drinks. The dessert menu is limited which made no difference as we were all completely full. One of the cool things about Meat & Shake is their style of high chair. My 1 year old sat happily in the high chair which clips on neatly to the table. This works because the tables are bolted into the ground, as we sat in a booth. 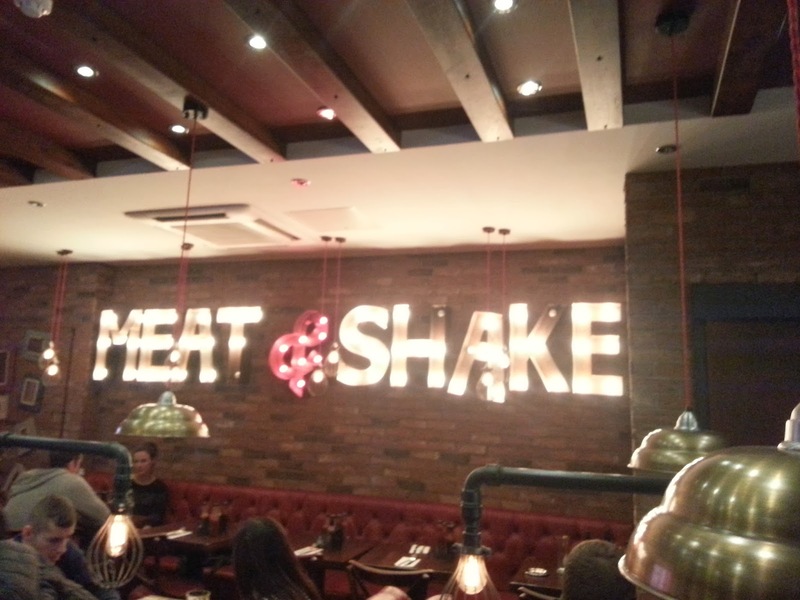 It may seem like just a burger joint, but Meat & Shake is so much more. They have successfully created a simple yet effective menu at a reasonable price, using good quality ingredients. In a food lovers haven like Tooting high street, they have a unique edge that will attract diners from far and away. I for one cannot wait for my next super duper burger and shake.